Home Money Travel Jobs Travel Jobs: How To Make Money Blogging From Anywhere? It’s the age old question (well, since blogs came about anyway)… You want to know how to make money blogging. 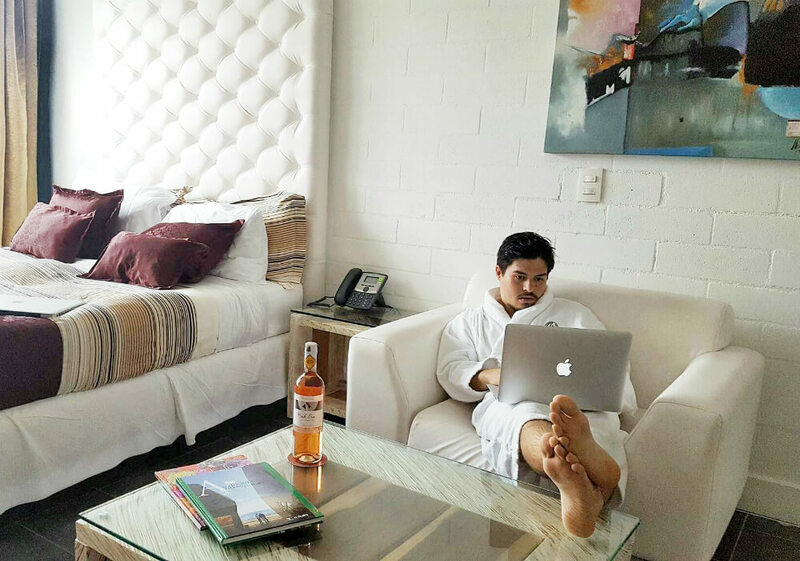 You’re also probably wondering how people make money blogging while they travel, right? You may have seen bloggers gallivanting around the world or getting paid to review amazing products. You may have even bought something off someone’s blog or clicked on an ad or two. Yet, still, you’re left wondering how on earth these people got to where they are today and how they’re making enough money to work from anywhere. You may be thinking that these kinds of travel jobs are only for journalists, tech experts and lucky people. Well, not exactly. Although I used to think so. I literally used to think you had to be a journalist to run a blog and get paid for it. I didn’t know who was paying the ‘journalist’ but I sort of figured it might have been some large media company who paid bloggers a salary to write content about them. What’s also funny about this is that 3 years ago I didn’t know a thing about how to make money blogging, especially while traveling. Now here I am, running a blog and traveling… Who knew? So I know that many of you are also confused about the way blogging works, how travel bloggers make money or how any kind of blogger makes money for that matter. And there is this common misconception that in order to make money blogging while traveling, you have to be a travel blogger. Well it is true that some travel bloggers do get paid to travel and review travel products but this is definitely not the only way! You can run any kind of blog or website and make money in a variety of different ways while you travel. 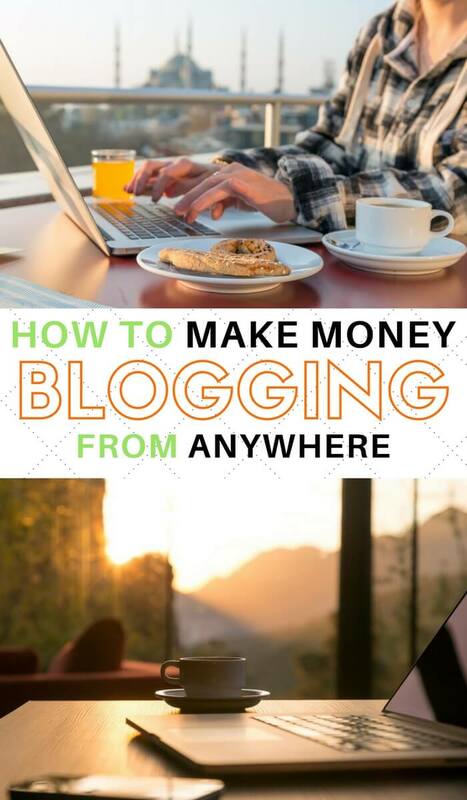 To make money blogging from anywhere in the world, the logical first step is to start a blog. You can do this on a number of different platforms but the most established and universal content management system is WordPress.org. You first need to purchase your domain name and find a platform to host it on. We recommend Bluehost as they offer our readers a 50% off introductory price and are endorsed by huge bloggers such as Pat Flynn from Smart Passive Income. It is important to tell you now, if you want to make money while traveling or turn your blog into a business, you must invest in it by becoming self-hosted (eg. www.storyv.com). Buy your little piece of internet land and own it. Starting a free blog (like storyv.wordpress.com) will immediately cut your chances of actually making it a successful income generator in half (probably more). 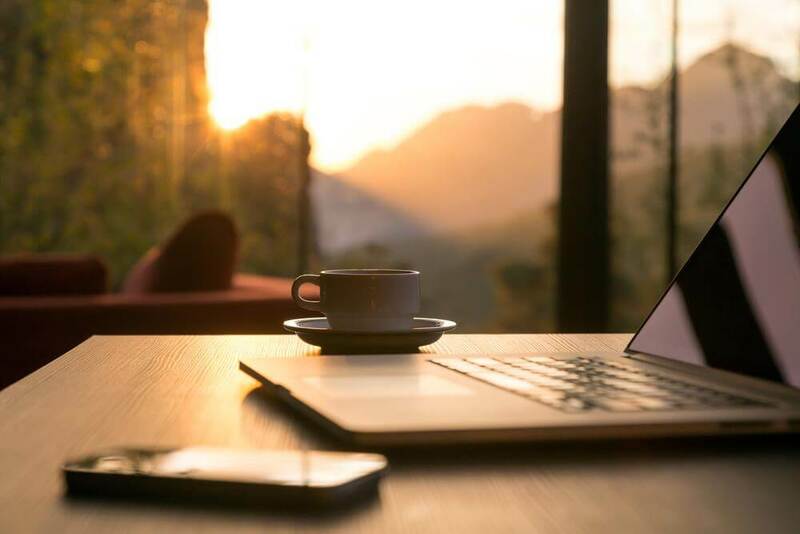 A free blog comes across as unprofessional and demonstrates that you are not willing to invest in your business – would this attract potential advertisers? Partners? Clients? When you start a free blog, you do not own it. If something happens to the platform your blog is hosted on (like it goes broke), you lose your blog. The owner allows you to spend a lot of time and money making it beautiful to live in and then they decide to sell it and keep all the profits (as they would, because they own it, not you). Probably but at the end of the day it was your decision to rent. Instead, you could have spent just a little extra per month to own it, build it up, rent out the spare rooms (to cover that little extra amount per month) then sell it and keep all the profits. This is exactly how blogging works. And this also goes for social media platforms like Facebook, Youtube and Instagram. You may have noticed a fast growing number of social media ‘influencers’ popping up all over the web recently. Most of these influencers earn their income purely on Youtube or Instagram. So what happens when that one social media channel they’ve decided to invest all of their time, money and effort into changes it’s algorithm, resulting in a considerable decrease in engagement? There can be major repercussions. Fewer likes, comments and views can all of a sudden turn into fewer advertisers, sponsors and partners which can all of a sudden turn into far fewer dollars in the bank account. Trust me, it happens. Many influencers felt the kick recently when Instagram decided to change it’s algorithm. So the lesson you need to learn from this is spread your time and energy evenly between a few different platforms, including your own blog because nobody’s taking that away from you. Don’t expect to monetise your blog however you like on a free blogging platform. There are a lot of restrictions. Buy your little piece of internet land and own it. It’s safer, it’s more professional and it allows you to create far more opportunities to earn a good income. Once you’ve bought your domain name through Bluehost and connected it to WordPress.org (not WordPress.com, this is the free platform), you can start designing your blog. Choosing a theme is the cheapest and easiest option (and there are thousands). We use the Newspaper theme through ThemeForest. For a step by step guide on how to start a blog, follow my free tutorial (where you’ll also have access to the Bluehost discount). The next step is to start creating content and lot’s of it! Get your content seen by the world by setting up social media channels like Facebook, Pinterest and Twitter directing your followers to your blog. It is also very important to optimise your content so that search engines like Google can find it and show it to people searching for particular keywords. This is called SEO. I highly recommend doing some reading on this and putting the strategies into practice. Growing the readership of your blog to the point where you can make a few bucks can take a fair amount of time, depending on how dedicated you are. The more quality content, the better and promotion is key. A lot of top bloggers use the 80/20 rule – spending 20% of their time creating the content and 80% of their time promoting it. If you’re after accelerated growth through large amounts of traffic (readers) and you have some budget to invest, advertise. There are a number of platforms you can advertise on, including Facebook, Twitter, Pinterest, Google, Taboola, Outbrain and many more. It is important to mention that you won’t start making a decent amount of money through blogging until you have a solid amount of traffic, so however you choose to get that traffic (social media, SEO, advertising, networking), give it your all. You can do this through a platform like Active Campaign or Kartra. Once a reader becomes a loyal subscriber, you can insert them into an email marketing funnel. This is where you set up an automated series of content to send out to them. In this automated series you can send them to popular blog posts, promote your products, promote affiliate products and build a relationship with them through more personalised emails and newsletters. Lastly, I highly recommend installing Google Analytics so you can see all of the data that relates to your site, including the amount of visitors, where they come from, how long they’re staying on your site, etc. Knowing this information is very important when you start working with advertisers and sponsors. >> Create your blog and start putting our strategies to the test now! Now we’ve reached the part where I’m going to dig into exactly how to make money blogging. Companies pay advertising networks to have their ads displayed across a range of sites. If you choose to be one of the sites where these ads are displayed, you’ll generally be paid per click (CPC) or per 1000 impressions (CPM). Popular ad networks include Google Adsense, Criteo and Taboola but some of them have criteria that you must meet, for example, a certain amount of monthly traffic. If you go to these platforms you’ll be able to learn about their criteria and sign up. Once you are signed up, you can choose the placement and size of the ads on your site and find further instructions on how to insert them. Unless you’re getting a lot of traffic already, it’s not normally worth putting ads like this on your site at the beginning. The payout is tiny when you have no traffic so you’re better of focusing on the user experience at first. Direct advertising occurs when companies come direct to you to display their ads on your site (or you can reach out to them). Again, you are usually paid per click (CPC) or per 1000 impressions (CPM). The amount of money you charge for an ad depends on a variety of factors, including the amount of traffic you have, where that traffic comes from, the size of the ad, where it’s placed and more. You can usually find pricing information and recommendations through a quick Google search. It also helps to network with other bloggers through Facebook groups as they can help to guide you. Sponsored content is another way companies can advertise on your site but the big difference between this kind of advertising and banner advertising, for example, is that sponsored content is usually in the form of an article. This is called ‘native advertising’. Review: This is where you receive a product in exchange for giving a review on your blog. Some companies offer compensation but most just offer the product. But it goes deeper than this because pricing can range depending on who writes the post, if the post already exists, whether you’ve been given the product, etc. Sometimes a company may only request a link in an article you have already published. Of course, you would charge a different price for this. Again, you can find sponsored post pricing information on Google and through other bloggers in Facebook groups. Be careful when you are just starting out. Even when you don’t have a lot of traffic companies will probably approach you asking to place their link on your site for $50 or something. While it might be tempting, this can be damaging because a) the links are usually spammy and b) the companies start thinking that all bloggers are only worth $50, bringing the value of the whole community down. You also need to be careful of companies who approach you asking to ‘guest post’ on your site but then include a spammy link to something they’re selling. A guest post is when blogger writes an article on another site to grow their portfolio and potentially get more followers and readers on their own site. The other thing is an ad so you need to charge accordingly. Affiliate marketing is one of the main ways we have monetised this blog and can be the perfect way for you to get started too. Basically, you can sign up to be an affiliate for a company and receive commissions when you make sales through promoting their products. This is all tracked through your own unique ID. Depending on the type of products you’re promoting, commissions can vary from as little as 3% all the way up to 90% (seriously!). Also, most sites with affiliate programs have cookies installed. This means that if someone clicks onto a site through your link and doesn’t buy anything but they go back a week later and buy something, you will still get the commission. There are so many ways to promote products as an affiliate, it just depends on how creative you want to get! Popular ways include blog posting, email marketing, displaying banners and investing in advertising on platforms such as Facebook. Many bloggers find it highly effective to include affiliate links in their automated email series, as I mentioned earlier. It is important to note that you should use and/or trust the products you are promoting, that they relate to your content or niche and that they will be useful or helpful for your readers. Remember, your subscribers are your most loyal and trusting readers so look after them. For example, say you create a Facebook ad for a $100 affiliate product where you make 60% on any sales you make ($60). You spend $300 on the ad and the average conversion rate (meaning the amount of people who buy through clicking on your ad) is 3%. This means you make 9 sales. 9 sales x $60 is $540. You just profited $240. You can then take that amount and invest it back into advertising. This time you have $540 to spend. With a 3% conversion rate, you make 16 sales. 16 sales x $60 is $960, and so it goes on. Contact product owners personally, build a relationship and then talk about potentially becoming an affiliate for them (this is where you’ll find the higher commissions, especially if you’re promoting digital products like courses). Recommended Reading: Travel Jobs 2016: What Is Affiliate Marketing And How Can You Profit From It While Traveling? One of the most effective ways to make money with a blog is to create and sell your own educational information products (eg. eBooks, courses, mentoring groups, webinars) in your niche. Your niche is basically the topic you blog about. Common niches include travel, fashion, DIY, food, relationships, fitness, productivity and many more. So what you can do is instead of giving away all of your best advice and strategies for free, you can create a product out of it and sell it. It’s also a known fact that when a person pays for something, they give more value to it. how can you use your blogging expertise to solve a burning problem your readers have? How can you provide THE solution through your content? Imagine you run a blog about fitness and weight loss. Your readers come to your site each day to get tips and strategies to lose weight but most of them don’t really follow your advice religiously enough to notice a difference in their weight. Because nothing is pressuring them to do anything. At no point have they made a commitment. They don’t take the information seriously enough because it’s free. For a start, they immediately take your advice more seriously because it has a value. b) They’ve made a commitment to themselves and everyone else around them so it’s kind of embarrassing if they don’t follow through. It is your job to make your readers understand that this is an investment in themselves. By charging for quality information and advice that your readers want and need, you are actually doing them a huge favour. Whatever niche you’re in, you are capable of making a difference in a whole lot of people’s lives, so create the best darn content you possibly can and sell it to them. A blog income earning strategy that complements info product creation and affiliate marketing well is providing a service. Popular services include coaching/mentoring, consulting and virtual assisting but you can get as creative as you like. Many people use their blogs as portfolios for the main way they earn a living and that is through freelancing. As a freelancer you can basically offer services such as writing, social media management, website design, video editing and more to other businesses on an hourly, monthly or full time basis. There’s all sort of tools these days to schedule appointments and receive payment through your blog but the main task is finding your customers. Again this is where advertising can comes in very handy if you have the budget. If not just keep on reaching out to people, networking and sharing your content. Once you have a few clients under your belt things usually get easier as they are likely to recommend you to other friends and offer you a testimonial for your site. eCommerce is something we haven’t tried yet but plan to in the future. You’ll often find that bloggers mainly earn their income through things like eCommerce and affiliate marketing but create blog content to drive traffic to their products. These days it’s easier than ever to set up your own store through a platform like Shopify and link to it through your blog. The great thing about this is that Shopify can also handle all your payments, etc to make it super simple to start earning an income online. Many travelers create and sell things like jewellery, t-shirts and natural health products but where do they keep all of their stock? Do they travel with their whole range of products and package and ship from where they are at the time? There’s a system called drop-shipping which practically means that you act as the shop front with your online store but then you source the products from other companies who have big warehouses and do all of the packaging and shipping for you. Alternatively, if you make your own products, you can have them shipped to your home base where you could pay and friend or family member to look after the packaging and shipping for you. Last but not least we have media familiarisation trips and paid speaking gigs. I guess you could say that these are not directly ways to make money blogging but they are definitely linked. How? Well, when you create great content it’s pretty much a given that you will build a loyal readership. The more visitors coming to your site each day to read and trust what you have to say, the more outside opportunities you will attract. FAM trips, also known as Media Familiarisation Trips can range widely but in the travel niche, a FAM trip occurs when a blogger is invited to visit and experience a destination in order to create content about it on their blog and social media channels. FAM trips have been known to range from a couple of days to a couple of weeks and are normally fully compensated. Sometimes, however, you can also receive payment on top of your compensated stay. I guess you could say this is how some people get paid to travel. FAM trips are not all fun and games though because you are often required to adhere to a strict itinerary, create a lot of content and present it within a short timeframe. Then you need to make sure your audience engages with the content you create and then report back to the FAM trip organiser with your stats. I don’t know about you but I think I would just prefer to make the money I need through any of the other ways I’ve mentioned above and travel on my own terms! Through blogging it’s also possible to get invited to speak at events. Sometimes speaking gigs can be paid (depending on the size of the event and how much authority you have in your niche), other times they are unpaid but can be a goo way to build up your authority. So, Can You Make Money Blogging? Why, of course! I’ve just listed 8 strategies off the top of my head and I’m sure there are a number of other ways to make money blogging too. Don’t listen to anyone who says you can’t make decent money blogging. They just haven’t tried all of the options long enough. Yes, it can take a lot of time and a lot of energy, but if you focus, create goals and voice them to everyone around you, invest in your education, don’t be afraid to ask for help, network and put in 10x more effort than you think you can, you will succeed. This just depends on how much effort, time and money you invest in your blog. Some bloggers make 50c per month, some make $1,000 and some make $200,000. If your goal is to reach those higher numbers, you need to take your business seriously. Being a ‘blogger’ is all well and good but you need to think about how you can use your blogging expertise to solve a burning problem your readers have. How can you provide THE solution through your content? Figuring out how to make money while traveling can be a difficult task. There are so many options for travel jobs out there but most of them are fixed in one place for a long period of time which isn’t ideal if you want to see more places. Then there are online jobs but all of them seem too complicated, scammy or don’t pay enough. If you do your research though, you can find amazing opportunities to work online. Blogging is one of them. 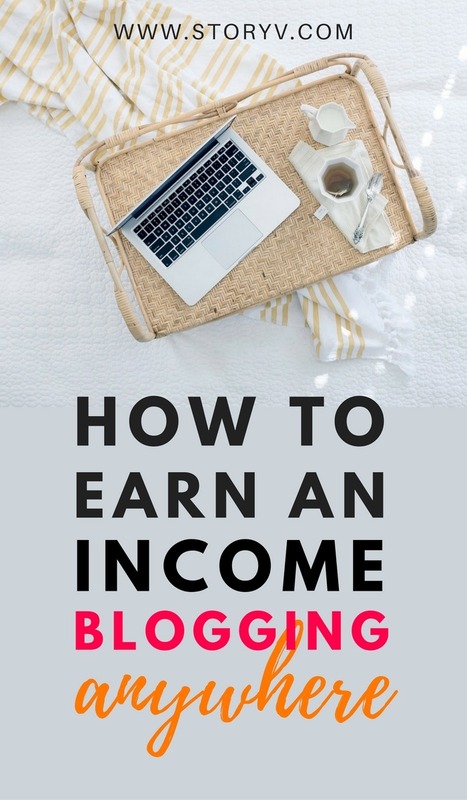 If you had no idea how to make money blogging before you read this, I hope that I have helped you to understand how it’s being done and how you can start and blog and make money as of right now. To get started, I highly recommend getting your blog up and running through Bluehost with our 50% partner discount. You can also join our VIP List where I send out an email each week to help you on your journey towards traveling more. When you sign up, you also get a copy of our eBook, 12 Steps To Full Time Travel for free, so there’s plenty more information on how to turn travel into a lifestyle coming your way! I wish you all the best on your blogging journey and if you have any questions at all, leave a comment and I’ll get back to you. See you on the inside! Disclaimer: This post includes affiliate links. This means that if you click through and purchase something, we’ll make a commission at no extra cost to you (in fact, if anything, you’ll get a nice discount). We use and trust all products promoted here and would never recommend a product that isn’t of value.